Anishinaabe Babamadizwin: A Journey By Canoe will work with at-risk Anishinaabe (i.e., Ojibway) youth to build both birchbark and cedar/canvas canoes, and then use those canoes on wilderness voyages. To quote the organization's description on the Aviva Community Fund site, "Such canoe trips could develop leadership skills as well as increase awareness of their Native culture and traditions. The youth participants return to their communities as future leaders." The organization is competing for a grant from the Aviva Community Fund by soliciting votes from the general public to demonstrate widespread interest and support for the project. To add your voice, go to the project page and register, then vote either on the page itself, or by "liking" it on Facebook. The Myanmar (Burma) photos were pre-digital scans of some photos I took while working/touring there in 1999 or 2000. 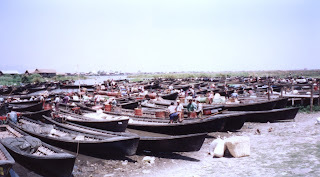 The photos are of longboats in Inle Lake in central Burma. I was interested in the articulated drive mechanism. 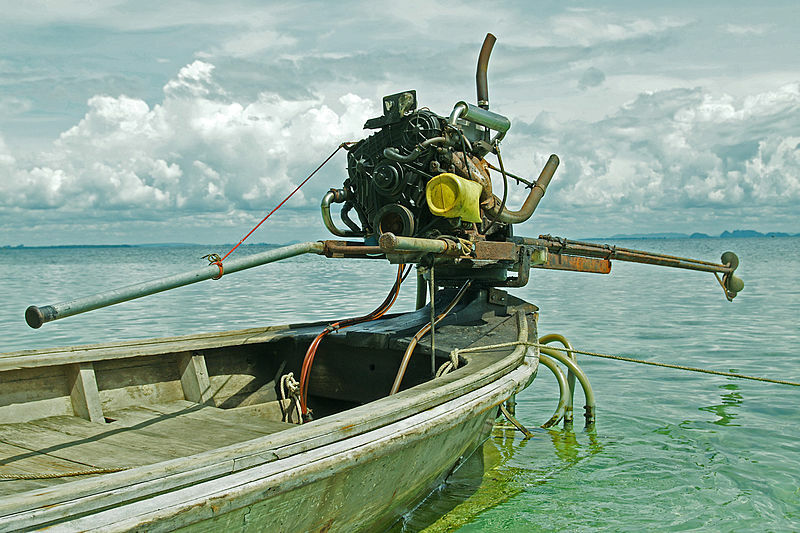 Unlike the longboats in Thailand, the engine is stationary with a universal joint at the transom. The pipe in the wash from the prop is for water cooling to the engine. Very simple and effective. I loved these boats and their chug, chug, chug with their big Chinese diesels. The long bow allows them to extend out over the shore for easy loading and unloading at the market. I don't have any photos of them but the leg rowers of Inle Lake are fascinating so give them a google if you haven't seen them before. I agree. This leg rowing is fascinating stuff. A rubber hose connects to the front of the water intake pipe and curves over the massive transom. By pushing down on the tiller, the driveshaft and prop can be raised. The gunwales extend far beyond the transom: I'd like to know the reason for this. Steering combines the forces of directed thrust (i.e. changing the angle of the prop, as on a sterndrive) and the rudder just ahead of the prop. These steering systems don't look cobbled together: someone is clearly manufacturing them to a standard pattern. With numbers like this, it's clearly an economically practical design that suits the needs of the society. 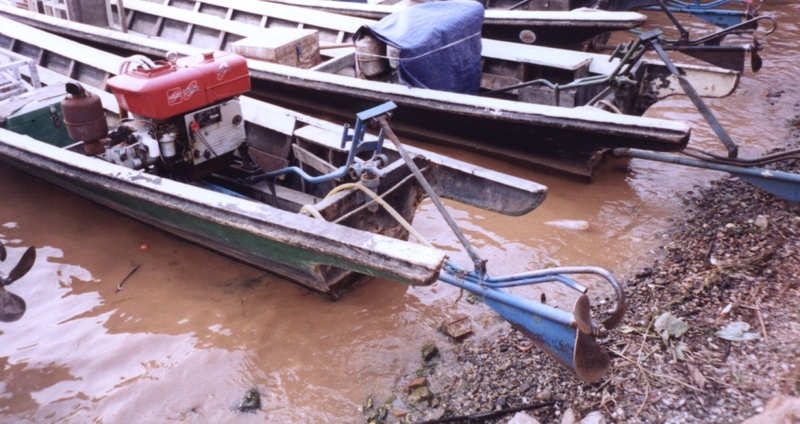 In contrast, Thai longtails mount the engine right on the transom, atop a pivot. This is mechanically simpler, in that it eliminates the universal joint for the driveshaft. It has a substantial downside, though: placing the weight of the engine entirely on the transom must make the boat very stern-heavy. It also orients the prop shaft at a downward angle, which reduces propulsion efficiency. To minimize this problem, the shaft is very long (making the angle shallower), but this "solution" compounds the problem of a long, awkward extension behind the stern. 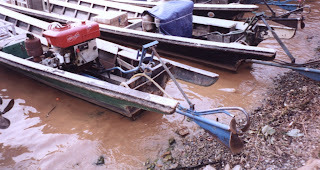 The Burmese arrangement, with its horizontal prop shaft, is shorter and inherently more efficient. Thanks again to Paul Wilson for the Myanmar photos. The Philippines Paraws (Bancas) photos were taken in 2002 at the island of Corregidor in Manila Bay. I loved seeing how the outriggers were attached using heavy fishing line and pipe fittings. Very practical. The garbage from Manila floats across the bay. As you can see, it is a bit of a problem. The attachments between outrigger boom and float appear to be pipe hangers. Paul's comment about the garbage being "a bit of a problem" is apparently understatement. Yuck. A sorry setting for a handsome boat. That's more like it! A handsome boat with a nice paint job deserves a clean backdrop. The banca's narrow hull makes the double outriggers a necessity. 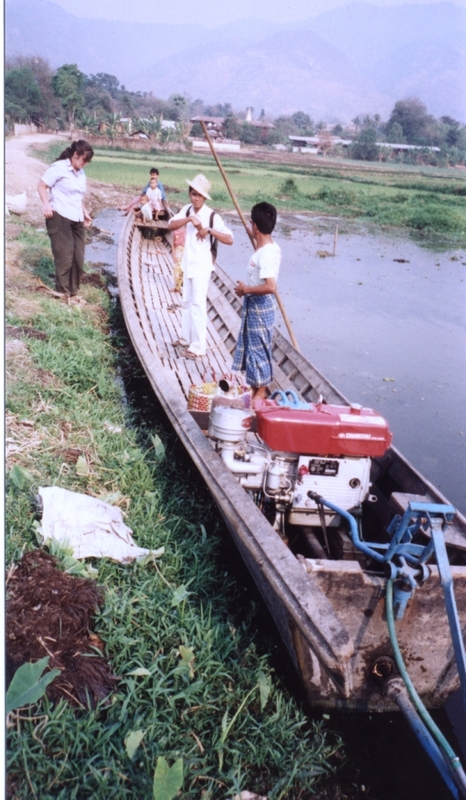 This photo and next: an abundance of heavy-duty monofilament fishing line secures the booms to the hull and the floats to the boom on this banca. The boat in the previous photo had two parallel lengths of bamboo for each float. This one has three. I've also seen floats of one and four lengths: it depends upon the diameter and buoyancy of the bamboo available and the stability needs of the boat. Tune in again soon for more photos of indigenous Asian boats by Paul Wilson, to whom we give sincere thanks. 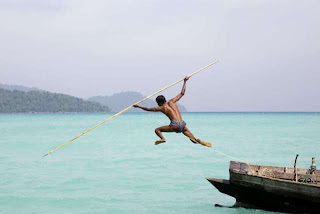 The Moken are an Austronesian people pursuing a nomadic maritime culture in the Andaman Sea. These "Sea Gypsies" live in the Merguyi Archipelago, several hundred islands off the west coasts of Myanmar and Thailand, traditionally spending eight or nine months of each year on the water, and coming ashore only during the monsoon season, during which they would set up temporary communities on islands relatively isolated from the larger mainland societies close by. The kabang is the traditional boat of the Moken, and while propulsion has shifted from a single woven pandanus square sail to outboard engines, the rest of the boat appears to be little changed. It is built on an expanded dugout base, with three strakes per side extending the freeboard to make a hull tall and wide enough to serve as a family home. Kabang. Source: http://tausug-global.blogspot.com/2010_12_01_archive.html. Click any image to enlarge. During construction, the dugout base is expanded (i.e., widened) by inverting the hollowed log and heating it over live fire. The log is then flipped over and, while it is still hot, temporary cleats are slipped over the gunwales near both ends to hold their shapes and prevent splitting. 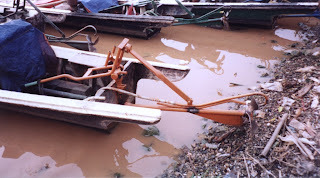 Then V-shaped clamps are slipped over the gunwales closer to midships on both sides and the clamps are levered outboard, pulling the sides with them. Partial decks of narrow planks are laid, and a house whose sides and roof are built of pandanus leaves is added. The sides of the house tilt outward, following the rather shallow angle of the hull sides and no doubt creating a bit more shoulder room inside. I've not seen any measurements, but I would guess the kabang's length overall at 40' or more. Here's a photo essay showing and further explaining several of the construction steps: unfortunately the images are very small. 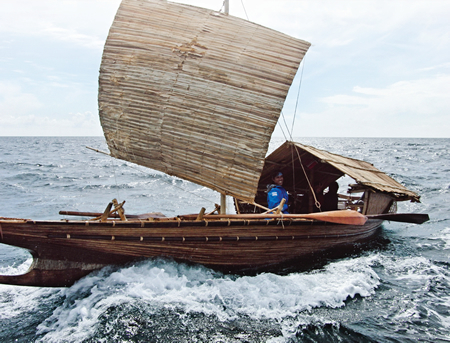 The Moken culture is in fairly dire condition, with perhaps 3,000 or 4,000 members remaining in total, and possibly as few as 1,000 still pursuing a traditional maritime-nomadic lifestyle. A movie called "No Word For Worry" about the Moken people and Moken-Projects is in production. More news about Moken-Projects is on Facebook. No doubt the earliest dugouts were blunt-ended, similar to Newnans Lake #19 in the image above, if one accepts that the shaded area in the profile view was indeed present in the boat as built. 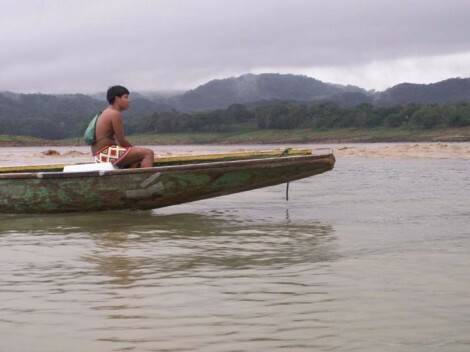 Regardless of their level of technology, anyone observing the behavior of the water at the bow of this design as the canoe moved forward would have eventually recognized that a smoother shape would be more efficient. The earliest modification was probably to round the ends. 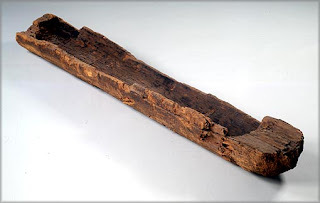 One of the oldest boats of any sort ever discovered, this blunt-bowed dugout, found in the Netherlands, dates to 8500 BC. Following that, the quest for efficiency might have led in two directions: toward a flat, overhanging bow, or toward a wedge-shaped bow, which might initially have had a straight vertical stem, gradually adopting a sloped, rising shape. 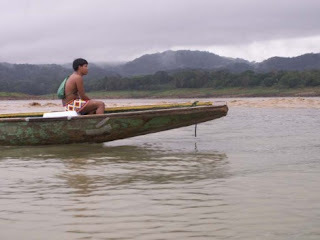 Flat overhanging bow on a Tusipono Embera Indian canoe on the Chagres River, Panama. Photo by Shawn J. Dake, 2011, from Maritime Matters. I believe the wedge-shaped bow would be more efficient through the water, but the overhanging design has the advantage of being able to be beached bow-in, making loading and unloading easier. In contrast, a wedge-shaped bow with a vertical stem is highly unstable when beached perpendicular to a sloping shoreline. Wedge-shaped bow and stern with nearly vertical stem and stern posts. Canoe of unknown provenance. From HistoryFaceBook wiki. It must have been thousands of years before more sophisticated (or decorative) shapes came into use. 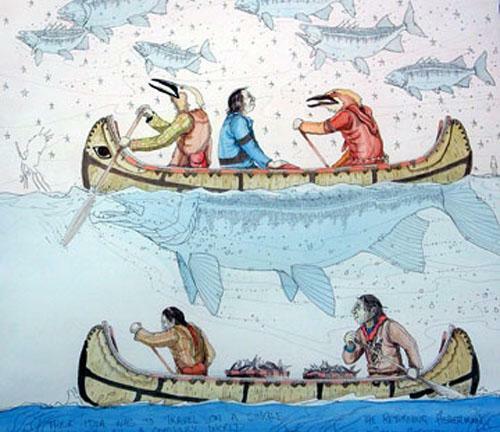 The overhanging platform shown in the Moon Lake canoe in the top illustration might give a spear fisherman a place to stand forward of the disturbance caused by the stem moving through the water, giving him a crucial few inches in which to make his strike. 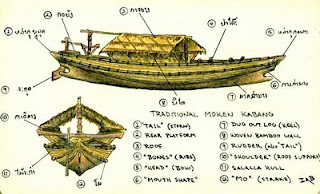 A similar platform for a poler in the stern would improve his view and ability to navigate through flooded grassland like the Everglades. A well-rounded bow like the one below provides plenty of buoyancy, while the raking stem allows it to ride easily over small waves. The pinched knob at the very end might make the end more resistant to splitting. Rounded bow with rising stem and extended, "pinched" end knob. 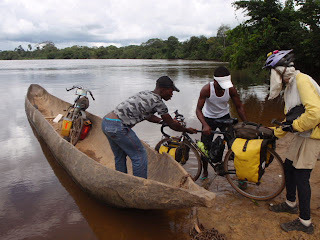 On the Cavally River, Liberia. From reCycling the World blog. These extended bows below could serve as carrying handles, or to help part the vegetation when moving through a swamp. 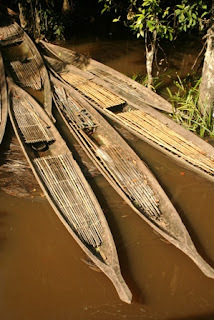 Very long, narrow bow extensions on canoes of the Orang Asal people of Malaysia. From My Rainforest Adventures blog. The heavy, blocky bow here seems to favor durability and simplicity of construction. The stern appears to be somewhat more refined, thinner, but with a transom shape somewhat like the bow. I suspect that, like the bow, the bottom of the stern transom is above the waterline, permitting the smooth wake. Blocky transom-shaped bow and thinner transom stern on a Canoa Indígena, Casco or Ubá in Brazil's Amazon region. 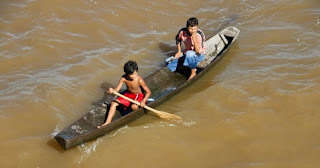 From Brazilian Boats and Canoes blog. I hesitate to address the variety of bow shapes employed by the First People of the Oregon/Washington/British Columbia region. These were complex, of great variety, and deserve an extended treatment of their own. Yes, we're looking at the bow of this canoe from the Queen Charlotte Islands, BC, The red triangular member, a kind of forward skeg, would doubtless have contributed to directional stability but might have made maneuvering difficult. Can you comment on other effects or purposes of this interesting feature? From a Ball State University teaching website highlighting material from the National Museum of the American Indian.